FW Murnau’s take on the Dracula story is one of the greatest horror films, not just of the silent screen, but of all time. When Bram Stoker's widow refused to grant Murnau the rights to Dracula, Murnau and his screenwriter Henrik Galeen simply changed the characters' names and went ahead with the film, creating one of the greatest horror movies, not just of the silent screen, but of all time. 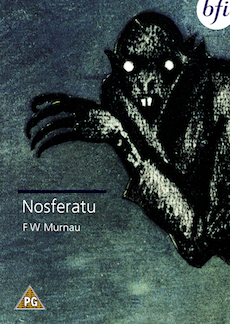 Murnau's visionary direction and the chilling performance of Max Schreck in the title role make Nosferatu nothing less than a masterpiece. The print has been restored by the Munchner Filmmuseum and the Cineteca del Comune di Bologna, and replicates the tints and tones revealed in the nitrate original. Presented by Photoplay Productions, this version also features a new music score by James Bernard, who scored many of the classic Hammer horror movies, including the 1958 Dracula. Film essay by Professor Sir Christopher Frayling. On-screen biographies of Murnau and Bernard. Downloadable ROM content of notes by Enno Patalas on the restoration of the film.